We lost a weekend due to the much-needed 20" snowfall. Today we plumbed the greywater tank and part of the freshwater system. We hung the greywater tank using 3/8" threaded rod through the floor, supported by 1" angle iron cross-members and 1/2" OSB (top & bottom). The angle iron supports were omitted for this dry-fit. The first step is to hang the tank so we can drill the holes for the sink and shower drain pipes. 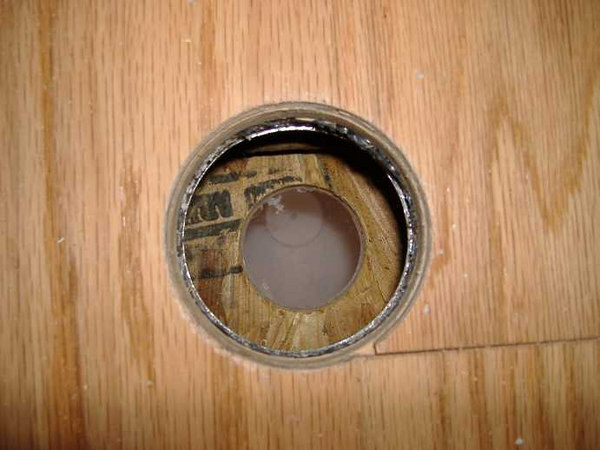 We drilled through the floor, OSB and tank using a bi-metal hole saw. The process takes about 15 minutes and nearly uses up a freshly-charged drill battery (18v Ryobi). After drilling the 2 holes for sink and shower drains, we dropped the tank and installed the Uniseal Slip Fittings. It helps to bevel the leading edge of the PVC to be inserted into the seal. We used dishwashing soap to lube the seal and pipe. We wanted to use unions on the PVC drain pipes so that if the tank has to be removed later, we won't have to cut any pipe or deal with the slip fittings again. 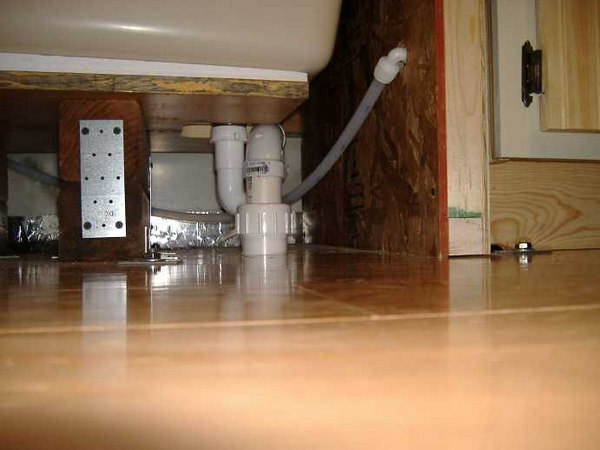 The nearest pipe is the shower drain; due to the limited space under the shower, the union has to go though the floor. In the middle-distance is the vent stack. It only protrudes above the top layer of OSB and doesn't need to go through the floor. The far pipe is the kitchen sink drain. The union will reside under the sink. The tank drain apparatus will be added later. 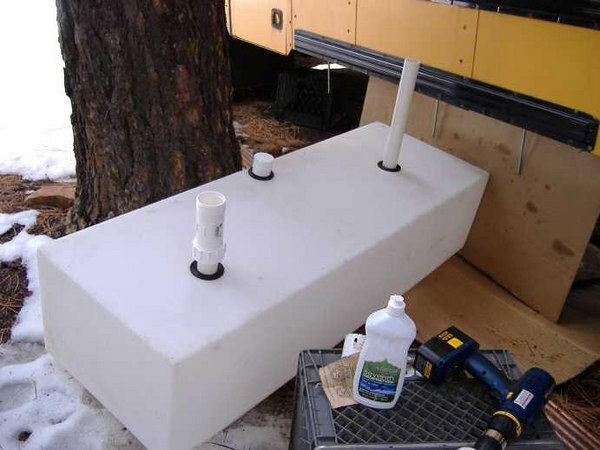 The tank has a 58-gallon capacity, and measures 20" x 13" x 58". We muscled the tank and bottom layer of OSB back into position -- everything fits perfectly! 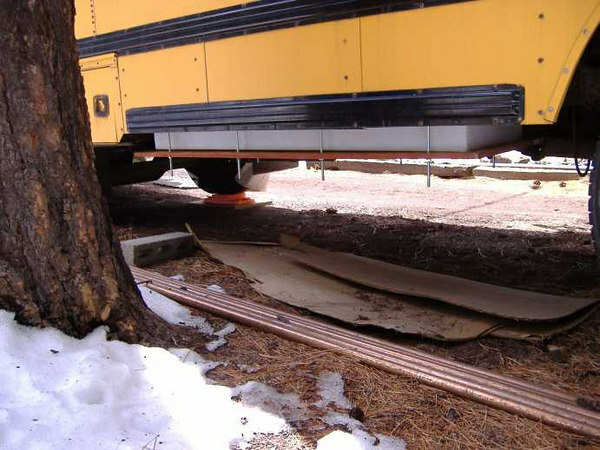 The 1" angle iron supports were painted with rust-inhibiting enamel before being attached. When full, the 58-gallon tank will weigh roughly 500 pounds. Eight support points means 62.5 pounds per...which seems to be a safe load. 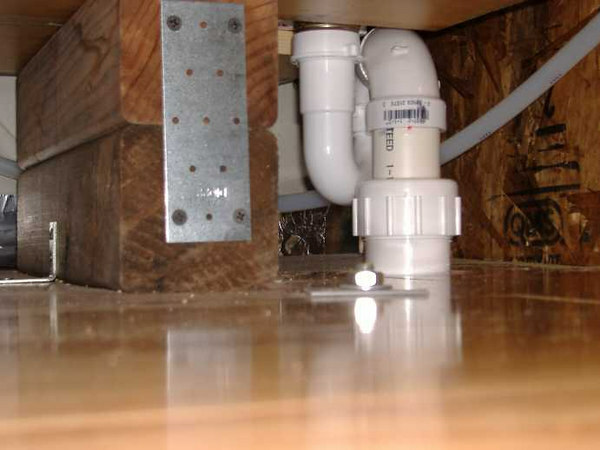 The kitchen sink trap, drain pipe and union. 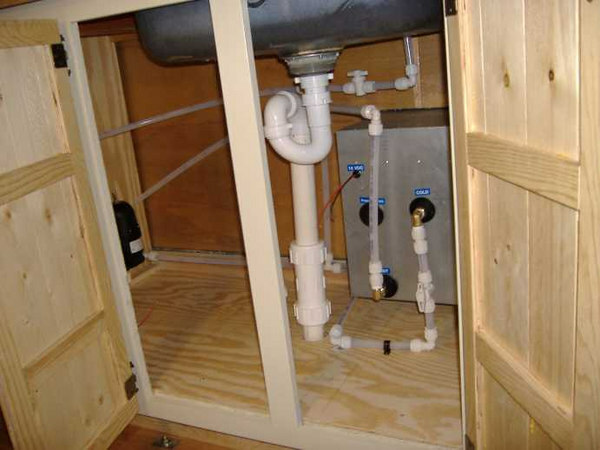 Also visible are many components of the freshwater supply, and the back side of the water heater. We used 1/2" PEX tubing for all hot and cold water supply lines. Just visible on the left wall of the cabinet is the pressure tank. Water pump and pressure tank. The water comes in from under the shower stall. 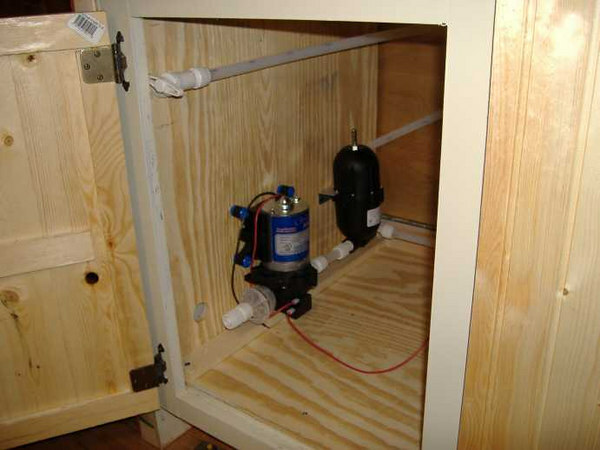 Fortunately the Shurflo pump can self-prime enough that the pump can be located far from the supply tank. The 2 PEX pipes coming into the picture from the right are for the shower hot & cold supply -- they aren't connected yet. The shower drain with trap and union. Also present is the freshwater supply line -- to the right is the kitchen counter unit. Close-up of the shower drain. The beefy 4" x 4" lumber are supports for the shower basin. In the foreground is the upper end of one of the threaded rods supporting the greywater tank. 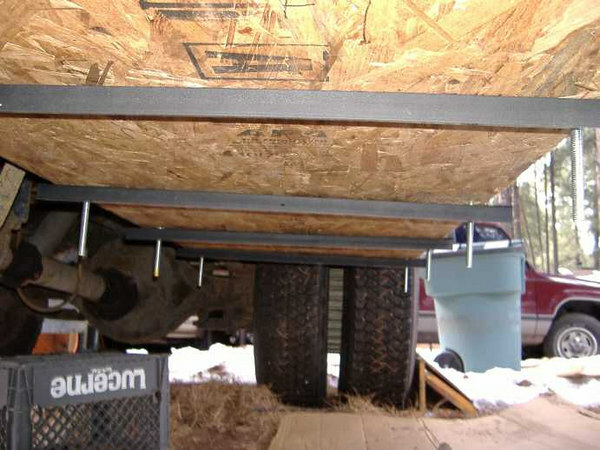 We used 1/8" steel plates under the nuts & washers to help distribute the load.